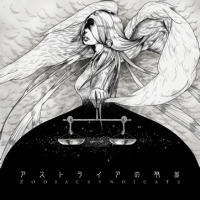 アストライアの双皿 is part of wac's Zodiac series of songs, representing Libra. アストライアの双皿 is the final unlock of jubeat saucer's bistro saucer 1st Set. It could be unlocked from September 25th to October 31st, 2012 after all other 1st Set songs are unlocked. In Greek mythology, Astraia (or Astraea) was a daughter of Zeus and Themis. She and her mother were both personifications of justice, though Astraea was also associated with innocence and purity. アストライアの双皿 is Jun Wakita's first purely instrumental song on the jubeat series. アストライアの双皿 received an EASY chart on December 12th, 2012 in pop'n music Sunny Park. アストライアの双皿 could be unlocked from February 27th, 2013 to March 3rd, 2014 in beatmania IIDX 20 tricoro/21 SPADA as part of the Café de Tran unlock system. It was the third unlockable song for those games. When played in beatmania IIDX, the arcade LED ticker for アストライアの双皿 displays "BALANCE OF ASTRAIA". The number "7" in the genre of アストライアの双皿 refers to the seventh Zodiac sign, Libra. Also, Zubenelgenubi is the second brightest star in the constellation Libra. Zubenelgenubi is also known as Alpha Librae. アストライアの双皿 can be unlocked in REFLEC BEAT colette -Spring- from June 12th, 2013 as part of the Pastel-kun to Smith-shi no RUNRUN marathon! (パステルくんとスミス氏のRUNRUNマラソン!) crossover event with jubeat saucer. It is the third unlockable song of the 3rd Meeting, after Smith-shi completes 45 laps around the track. From REFLEC BEAT groovin'!! to REFLEC BEAT VOLZZA 2, アストライアの双皿 was playable by default. In jukebeat, アストライアの双皿's title was changed to Balance of Astraia. After being removed from the initial release of REFLEC BEAT 悠久のリフレシア, アストライアの双皿 was revived on June 8th, 2017. アストライアの双皿's EX chart was re-rated in pop'n music うさぎと猫と少年の夢 on December 19th, 2017. アストライアの双皿 is available in beatmania IIDX INFINITAS as part of the beatmania IIDX INFINITAS 楽曲パック vol.3. This page was last edited on 18 April 2019, at 04:36.